Can't you see ? Can't you hear ? Can't you feel the end is near ? Hotel Room (1931) by Edward Hopper. 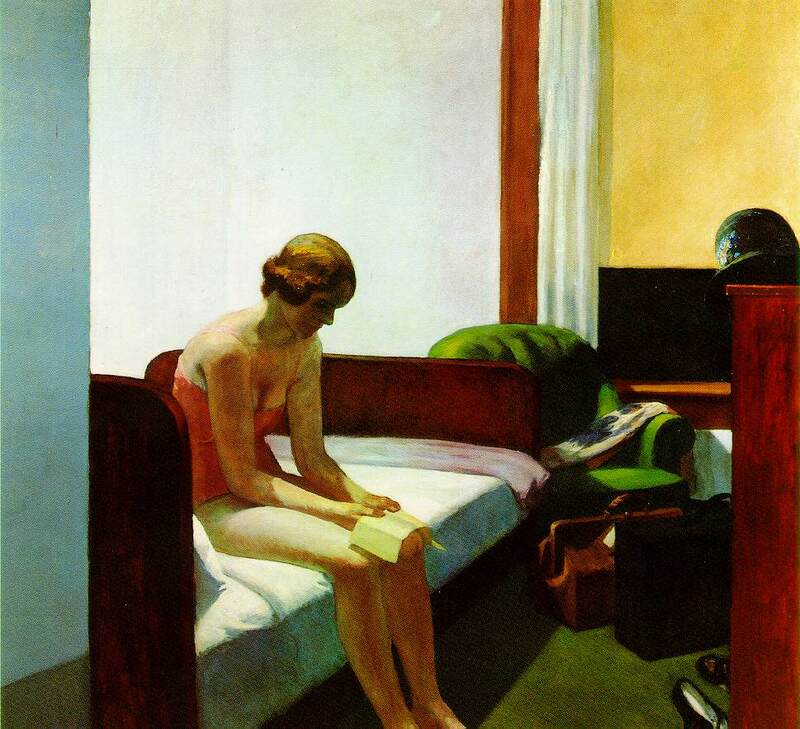 Hotels offer an opportunity to escape habits of mind, and it is not surprising that Hopper painted them repeatedly - Hotel Room (1931), Hotel Lobby (1943), Rooms for Tourists (1945), Hotel by a Railroad (1952), Hotel Window (1955) and Western Motel (1957). As the confidence of the 1920s gave way to the uncertainties of the Depression era, Hopper's subjects increasingly became uncommunicative figures, often alone in empty rooms. He translated their personal dramas into something timeless and universal, in images of stillness and solitude that suggest - but never describe - a narrative. Hopper's paintings invite endless interpretation; they have been variously described as representations of loneliness, alienation, melancholy or solitude - the angst in the soul of modern America. Emptiness and silence pervade Hopper's scenes. New Yorkers find themselves alone in the supposed privacy of their homes and hotel rooms, but also in the public realm of restaurants, lobbies, theaters, and the street. In New England, houses and lighthouses stand secluded on hillsides or along the coast. In other works, the presence of additional figures - a fellow diner, traveller, colleague, or spouse - only renders the isolation more acute by unfulfilled promises of true companionship.